Holbeach midfielder Andrew Tidswell (right) is reportedly a transfer target for Yaxley. Yaxley boss Brett Whaley admits he has felt like a ‘Sunday League manager’ in recent weeks. The Cuckoos have seen their four-pronged drive for honours damaged by a string of injuries and unavailabilities. Unusually for a United Counties Premier Division side, Yaxley could only field a bare 11 and no substitutes in last weekend’s 1-0 win over Boston Town. Unfortunately a depleted side couldn’t stop Premier Division leaders AFC Rushden & Diamonds winning a UCL KO Cup quarter-final tie 1-0 at In2itive Park on Tuesday. The title is out of reach for Yaxley as well, but Whaley is determined to ensure that the season doesn’t fizzle out. 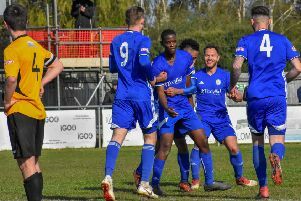 His side have a Hunts Senior Cup Final to look forward to in May and they play UCL Division side Bourne in a Hinchingbrooke Cup quarter-final later this month. Whaley is also trying to strengthen his squad with Holbeach midfielder Andrew Tidswell rumoured to be a transfer target. “It’s been a tough few weeks for us,” Whaley admitted. “We’ve had a player shortage and we’ve had some tough games. I did feel like a Sunday League manager when I was scratching around for a side 24 hours before last Saturday’s game. “But the lads responded well to win that game and it’s important to me and the club that we achieve our aim of a top three finish as that would be the best in the club’s history. Our run-in isn’t too bad. Yaxley are at lowly Harborough this Saturday. Rushden & Diamonds will host Wisbech in the KO Cup semi-finals after the Fenmen saw off Cogenhoe 4-3 on penalties following a 2-2 draw. Wisbech have also emerged as Diamonds’ sole Premier Division title rivals after securing 12 consecutive wins. Sacked Peterborough Northern Star manager Darren Jarvis has replaced John Chand at Holbeach.